“Listen carefully to me, and you will eat well, you will enjoy the fat of the land.” How did early Judaism understand the Messianic Era, and what developed throughout time in Jewish thought? 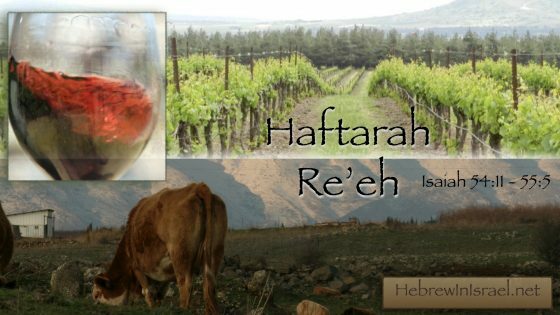 Haftarah Re’eh describes a day of lush abundance for the land and people who are faithful to YHWH. Shalom, Interesting viewpoints. Your interpretations of Isaiah differ greatly from KJ and many other translations I study. Today iis the first day of visiting your site, Heard about you from your podcast with Nehemia Gordon. I am not a Jew, raised in Christianity, but have been blessed with wisdom from Yehovah to seek out Jewish teachings to help me learn Godly Truth. As I read Torah, God’s people were commissioned to teach all of us, but sadly, too many in the world believe in the replacement doctrine; that since Yehovah “divorced” Israel, that now Christianity is His people’s. I disagree with that. He “may” have sent Israel away with a bill of divorcement, but not Judah/Levi, though YHVH says they too sinned. I’m sure somebody had to keep carrying the knowledge of God. Actually I have great respect, admiration, loyalty, some love, and deep concerns for the Jewish people’s. I cannot believe that in the recent LGBT parades that nobody in all Israel had enough ZEAL for Yehovah to call for everyone to come out and stone these people per Torah. PURGE the evil from your midst. Though not anxious myself to see violence or anybody killed, lack of zeal among the people of God, THAT TRULY disappointed me. If nothing else, I would have hoped somebody was jotting down names and that the government contacted each participant and gave 30 days notice to get out of the country, Get OFF God’s Promised Land, or be stoned. I had “hoped” that God’s people were more righteous than to put up with Gay parades, especially after Sodom & Gomorrah. Do the peoples think we can perform the same abominations and Yehovah will turn a blind eye? Beware America, Israel, and any other nation that gives rights to these people’s as destruction from the Almighty WILL, MUST follow!